Students from Muswellbrook High School gathered at UON Upper Hunter in Muswellbrook to present their projects to an audience of family, friends, industry representatives, and academics from the University of Newcastle. The projects required students to use their science, technology, engineering and mathematics (STEM) skills to develop a solution to a local community issue in Muswellbrook. 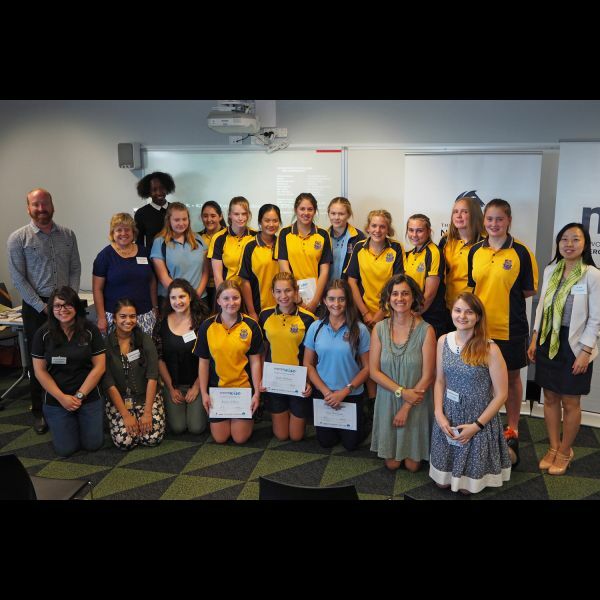 Students worked alongside university mentors to develop solutions including a game to educate people about the flying fox population, a website for locating community gardens, and a plan to use ‘nudge theory’ to prevent further pollution of Muscle Creek. After much deliberation the judges, Professor Erica Wanless from the University of Newcastle and Renny Chivunga from Hunter Water, announced a winning project. The winning project, an app for educating Muswellbrook residents about electricity use, was designed collaboratively by Bronte Collins, Hannah Franklin, Maddison Gill, Lydia Hume, and Jessica Xia. The Muswellbrook mayor, Martin Rush, presented the girls with a prize to commend their accomplishment. Muswellbrook High School’s participation in the project has been a huge success. The school’s principal Elizabeth Bate praised HunterWiSE at the awards ceremony, indicating that the project generated talk about subject selection for Year 11 and 12, and for the first time in years the school will be running a Year 11 Chemistry class of over 20 students. “It was inspiring to see the girls’ hard work and dedication showcased. Each and every student should be proud of her achievements,” said HunterWiSE project officer Stephanie Reed who oversaw the implementation of the pilot program in Muswellbrook High School. With support of their generous sponsors - Muswellbrook Council, Hunter Water, Glencore and the University of Newcastle - the HunterWiSE team are already planning to continue the program next year. Together Prof Regina Berretta, Dr Karen Blackmore, A/Prof Anna Giacomini, A/Prof Sarah Johnson, Dr Elena Prieto, A/Prof Juanita Todd, and Prof Erica Wanless hope to deliver a similar intervention across three Hunter schools, including Muswellbrook High, next year.